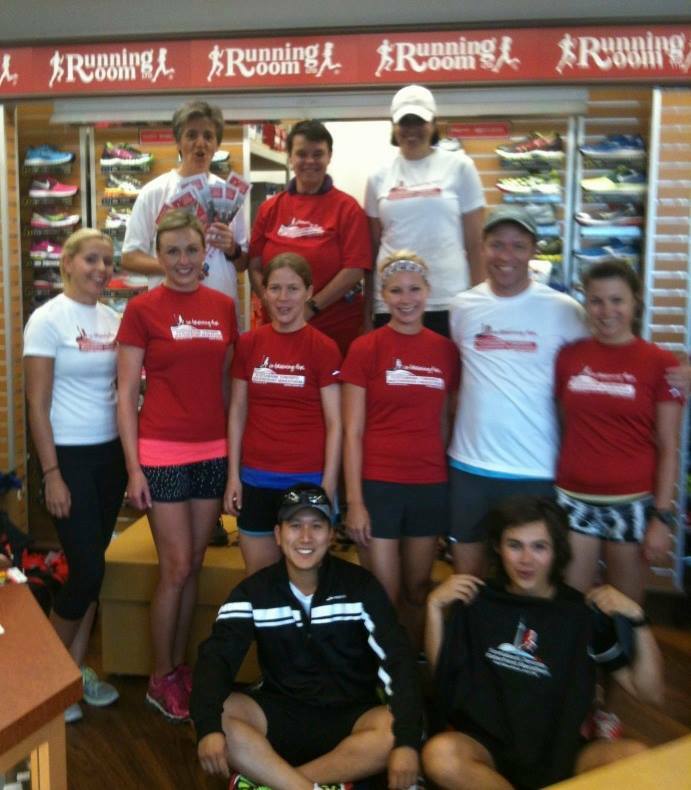 Not the best pic, but this is the awesome Marathon Group at The Liberty Village Running Room! Training for a marathon is no easy task – especially by yourself. That’s why as soon as I made the decision to run a marathon, I signed up for the Running Room marathon training clinic. The thought of running distances of more than 20K alone made me cringe. I knew I was going to need a group to keep me committed and motivated. Plus, it’s great to be around a group of people that totally get it. We all have a common goal so it’s easy to support each other. Consistency: When running solo, it’s easy to bail. I can very easily convince myself to stay home on the couch or go shopping instead of going out for that 15km run I had planned. But when there’s a group involved, there’s a level of accountability. Especially if you’ve told someone you’ll be there. You also tend to give up less when you know the group is waiting for you around the corner. Confidence: With The Running Room, I’m never left wondering if I’m training enough. In the past, when I trained alone, I often wondered if my runs were long enough. I worried that I wouldn’t be ready on race day or that I undertrained. These guys are the experts. Thousands of people have done this clinic before me and run a marathon so that gives me total confidence that I will be ready by race day. Improved performance: Who doesn’t love a little healthy competition? I’ve been noticing that running with a group makes you try harder. It’s kind of like positive peer pressure. I did some reading online about group running and several articles support this theory. In fact, Rob Udewitz, a sports psychologist in New York, said many runners actually change their pace when they run in a group. “There is a phenomenon of running with people where you run faster and easier,” he said. It’s true! When you’re running with other people who are better and faster than you are, it motivates you to take it to the next level. New friends: Running in a group is a great way to meet new people, especially people who have similar interests and abilities. The run also seems to go by quicker when you’re chatting with a new friend. I love running with a group of girls who like to chat. Kilometres just fly by when you’re gossiping. New routes: Not only do you discover new places to run, you also discover new places along your running route. New restaurants, new stores, random parks…it’s a great way to find new things in your own city. The other great thing about The Running Room? Our Sunday morning runs are open to anyone! Come join us this weekend – there’s a variety of distances to choose from. For more information about the different training clinics available, check out the details here. This blog post also appears on the Scotiabank Toronto Waterfront Marathon Digital Champions blog here. Check out other great training stories and advice from my fellow Digital Champions as we train for the big day on October 20! Is EMS Training good for runners? I love my group runs, they definitely push you. Running alone has its perks as well and it’s nice to be alone with your thoughts sometimes. Best of luck with your race! I agree – pros and cons of both for sure.